Philadelphia 76ers center Joel Embiid (21) is fouled by Boston Celtics forward Jayson Tatum (0) and center Al Horford (42) during the first quarter at Wells Fargo Center. There are a lot of issues for the Sixers in a matchup against the Celtics. The discrepancy in guard play is fairly significant, with Boston's guards uniquely capable of punishing Philadelphia's athleticism disadvantages when the opportunities present themselves. Ben Simmons' dominance in transition is stifled, and the Celtics play him to perfection in the halfcourt. Has Sixers' Elton Brand become the front-runner for NBA Executive of the Year? All of those things could be dismissed if Joel Embiid could start winning his matchups with Al Horford, or at least drawing even with him. But in yet another game against their rivals to the north, Embiid struggled to get going against Horford, and Philadelphia lost accordingly. With Horford mirroring his minutes for a lot of the night, Embiid sputtered to a 9/22 performance from the field, and that flatters his night more than it should after a 3/12 start to the game through three quarters. To everyone in the arena and at home, it is obvious that Horford is giving him problems. But ask Embiid what the problem was, and he'll tell you that it was his failure and his failure alone that led to another miserable night against Boston. "He's not doing anything, it's just on me. I was sleepwalking for three quarters, and that's on me," Embiid said. "It has nothing to do with anybody [else]." I don't buy that, and you would hope Embiid doesn't either. An even cursory glance at the tape shows how hard Horford makes him work on offense, even when Embiid ends up succeeding against him. Embiid is throwing his full weight into Horford and he's barely moving, and if not for the foul call, Jayson Tatum probably picks up his second block of Embiid in the first four minutes of the game. That is symptomatic of a lot of possessions pitting Embiid vs. Horford and is the biggest difference in this matchup for Philadelphia compared to any other playoff opponent. Put Embiid against most other centers in the league, and that level of physicality is pushing his opponent back several feet on the first dribble. Horford standing his ground buys time for Boston to tag Embiid with help defense from all over the floor without having to compromise their overall defensive integrity. "I think they're showing a lot, they show numbers to where Jo has to think about what move he's going to make. And by the time he does, there's usually another defender there," Ben Simmons said after the game. "We just have to keep looking for him." 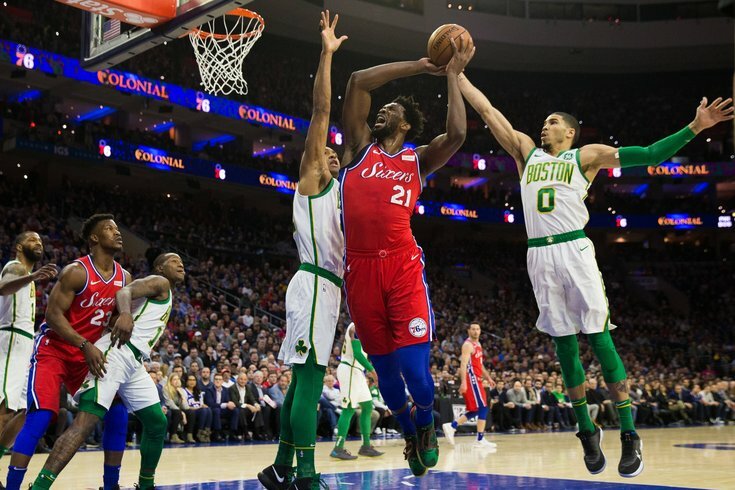 And that's before we get to the extra work Embiid has to do against the Celtics on the defensive end, work that prompted the Sixers to make small tweaks to their defensive scheme over the offseason. Horford is unlike most of the players Embiid goes up against around the league — the guys that can pull him away from the rim on defense tend to be paper mache on the other end, where Embiid can tilt the matchup in his favor and force his opponent into foul trouble. While Horford probably gets away with some physical play that other opponents don't, he's also better prepared for Embiid's arsenal of moves than most bigs around the end. He doesn't often get suckered in by the pump fakes and the foul-drawing tactics, and by just remaining steady, he flusters Embiid. "He's a hard matchup for us because he's physical, he's so strong. You get into that pound, pound back-down game...he's a difficult person to score on," Brett Brown added. "Trying to loosen up maybe Joel's world, I think I can help Joel better in that environment. The fact that Al can step out of stuff and make threes, legitimate inside-outside stuff, is hard to navigate at times." Embiid seems to disagree with Horford's physical play being legal at times, which he made quite clear after Tuesday night's loss. After wrapping up his media availability, Embiid opted to take a sure fine to make his feelings known. "The referees f*cking sucked," Embiid said as he retreated back to the locker room. There were certainly some blown calls that didn't go in his favor. He shot just four free throws against Boston on Tuesday night, and the officials missed a pretty obvious Horford foul in a big spot. We are past the point, however, where we can write off Horford's success against Embiid on the defensive end as a simple product of friendly officiating. The Sixers need to figure out a way to navigate this matchup that doesn't rely on Embiid playing hero ball, trying to will his way through Horford to his own detriment. There are signs that they're doing this, despite an overarching belief that Brett Brown has not adjusted against Boston. The Sixers ran 31 pick-and-roll plays against the Celtics on Tuesday night, according to Synergy tracking data, which is a change from their overarching philosophy that leans into the strengths of their midseason acquisitions. Jimmy Butler has definitely made a difference in this matchup, with his ballhandling ability giving Philly a different presence on the perimeter. Embiid was not the beneficiary of these looks. But that's why they brought guys like Butler and Tobias Harris in — when Embiid can't be the guy who tilts the court, they need players who can disrupt Boston/Horford enough to keep their defensive anchor occupied long enough to create an opening. Lineup tweaks will continue for Philadelphia. I do not think we'll see Boban Marjonovic in a potential playoff series against the Celtics. Who knows who the Sixers will turn to — Jonah Bolden, Simmons at small-ball center, or some other unknown option — but the next battle with Boston could very well look different, and the rotation will shorten if they happen to meet in the postseason again. The bottom line is this: Joel Embiid is at the center of everything Philadelphia does on both ends of the floor, and he hasn't found his groove against this team yet. Boston is happy to let him shoot from deep, where he continues to be below average, and the area of the floor he traditionally dominates has been walled off by Horford. The story remains the same now as it was last May, and the fourth-quarter flurry on Tuesday night was mostly about simple shotmaking, rather than any sort of big change in approach. You're not going to get Embiid to admit Horford bothers him. But if he's not taking this matchup seriously in private, going over film and assessing how he can start tipping things back in his direction, Philadelphia will continue to struggle to beat Boston.